Just make sure your speakers are switched off if you're in the office! 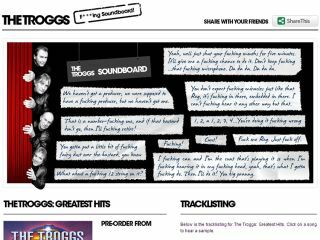 To celebrate the release of The Troggs' Greatest Hits album on 24 May, The Troggs F**king Soundboard has been launched. With samples taken from the Troggs Tapes - a hilarious audio document of the band's potty-mouthed studio in-fighting - you, like us, can now waste hours of your working day creating a symphony of expletives. The Greatest Hits album itself contains 25 songs from garage classics like Wild Thing and I Can't Control Myself to the much-covered Love Is All Around and eight tracks taken from the band's 1992 collaboration with REM, Athens Andover. The Troggs F*cking Soundboard also features audio samples of all 25 songs on the Greatest Hits CD and pre-order links to retail sites so that you can buy it and help fund frontman Reg Presley's passion for the paranormal.